Since moving from southern California to the cool Pacific Northwest this summer Masih Fouladi, has come to know the local Muslim community from both an organizational and personal level. 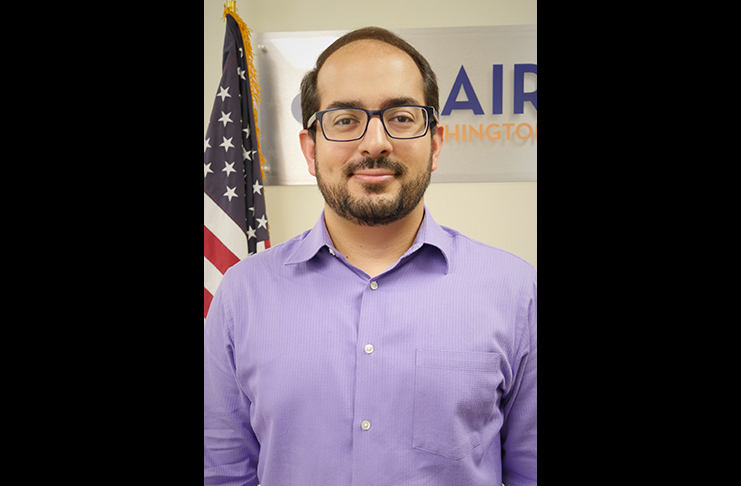 Fouladi is the new executive director of the Washington chapter of the Council on American Islamic Relations (CAIR-WA). Warm and approachable by nature, Fouladi is used to moving around. “I was born in Iran, and my family moved over when I was under two years old, so I was fairly young when I moved to the United States,” he said. Fouladi’s family settled in Orange County and he grew up in Anaheim. He attended UC-Irvine for his undergraduate degree, studying Economics and Cognitive Psychology, and then went to Law School at UC-Davis. Fouladi had an interest in policy work from a young age, but he didn’t see it as a career path at first. For a while, he volunteered with CAIR-LA in his spare time, thinking he would become a doctor and do advocacy on the side. “I also got involved in some of CAIR’s youth programs, and even went to Manzanar [concentration camp for Japanese Americans during WWII] on a trip with them,” Fouladi said. This led to a legal internship with CAIR-LA during his undergrad, where he found his passion, and ultimately his career. Fouladhi emphasized that much of his engagement with CAIR happened after September 11, 2001. It’s a landmark year for many Muslim Americans, , as Islam and Muslims continue to be demonized in the years since. But another thread that runs through Fouladhi’s life is his identity as an Iranian American. It is his work at CAIR where Fouladi feels he can help the most. Since becoming CAIR-WA’s Executive Director, Fouladi visited local mosques for Friday prayers, talked with the people, analyzed hate crime statistics, and focused on issues facing the Northwest Muslim community. ”Within the scope of CAIR, our work with bullying of Muslim students in schools, questions of immigration and citizenship, and hate crimes are some of the greatest challenges,” Fouladi said. CAIR-WA also tracks data and offers advocacy for victims of Islamophobic hate crimes and incidents. “While Seattle likes to think of itself as a progressive haven for minorities, the truth is that we are seeing an increase of anti-Muslim hate crimes and incidents not only in Seattle, but across Washington,” Fouladi said. CAIR-WA also advocates for Muslims caught in the immigration system of the United States, offering both legal advice and action.